I promised (aka, threatened), in the comments on the Iliad, that you'd all get to here me rant again, on the Odyssey. That day, my friends has come. The Odyssey is a very different book from the Iliad. It's much more focused - there is one guy, and the whole book was about him, pretty much (excepting the three chapters at the beginning that follow his son's search for him). I'd never read it all the way through - I think I just read the juicy parts before. I had no idea that half of the Odyssey is devoted to Odysseus killing off his wife's suitors. Actually, all of the juicy parts (cyclops, Circe, etc), are actually a little less than a quarter of the book. The Lotus Eaters - my favorite part, and the inspiration for a story I wrote once - are actually like... oh... a paragraph. That's it. "And willing nations knew their lawful lord." This, after he has marched out with his close supporters and thrown a spear at the leader of a group of angry citizens, a man upset because Odysseus just killed his son. But, his son's life was not as important as Odysseus's. Honestly, the book made me think of the Old Testament. You feel sort of betrayed, because God keeps acting in a way that you can't reconcile with the goodness that you keep hearing about. It's frustrating and painful. The world is completely amoral - worship strength and power, and you will make it. Remain loyal to your masters, and they will take care of you. These are practically very wise statements, I suppose. But I don't like them. PS - This image comes up under Odysseus in Google Image Search. Seriously. I don't remember getting anything out of the Odyssey when I read it in college. Probably, that was because it was all in epic poetry, so it slipped through my brain without making any impressions. But even through all the lectures and such we had on it, and the papers I had to write, I don't remember anything except that it was really boring, and I couldn't see why anyone thought it was so great. Keep in mind I was a freshman, 18 years old, at the time, and I'm sure that somewhat influenced my views. But still, I can't personally consider going back to all the greek stuff we read that first semester of the Human Situation. Not my thing, I guess. The only thing I remember liking was Medea. Plus I've never been a big fan of adventure novels. 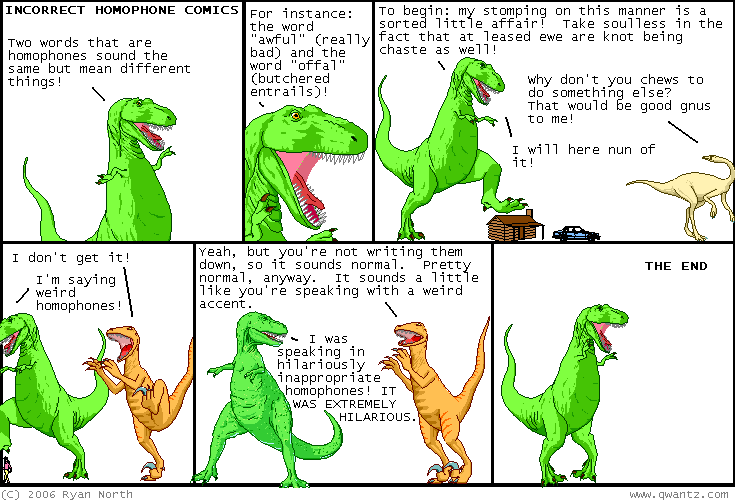 Dinosaur Comics is très cool. i must have an inferior version of Google Images though. this doesn't appear when i type in "Odysseus".